Extreme Drama: The Life And Music Of Richard Wagner : Deceptive Cadence Marking the 200th anniversary of the controversial composer's birth, conductor Marin Alsop and friends rethink Wagner in a series of multimedia concerts. 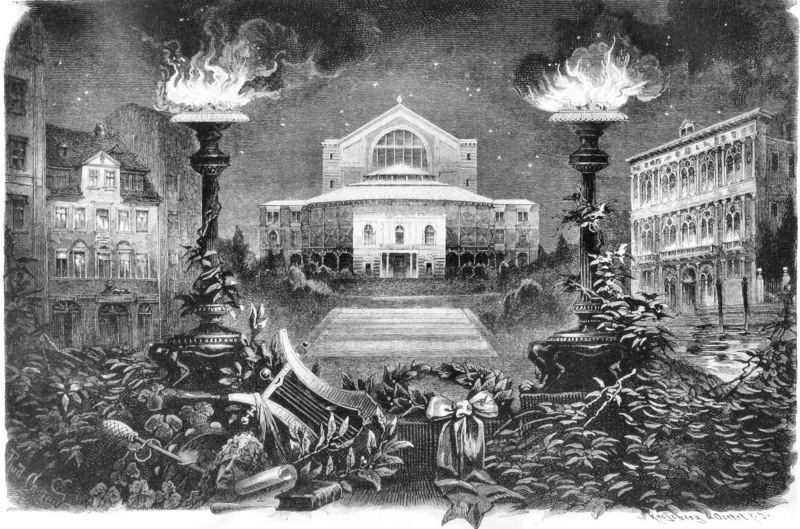 Rudolph Cronau's drawing of Wagner's opera house, Bayreuth, flanked by his birthplace (left) and place of death. Richard Wagner was, and still is today, arguably the most controversial figure in classical music. 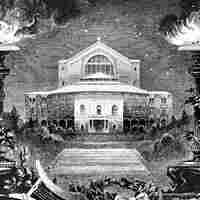 A self-appointed deity and hyperdriven genius, Wagner is often considered the ultimate megalomaniac. He dreamed up and achieved a single-minded plan to change the course of classical music history. With the 200th anniversary of Wagner's birth approaching on May 22, musicians and music lovers worldwide will explore not only his operas, but also his extreme politics and egotistical worldview — in the process barely scratching the surface of this complex man. 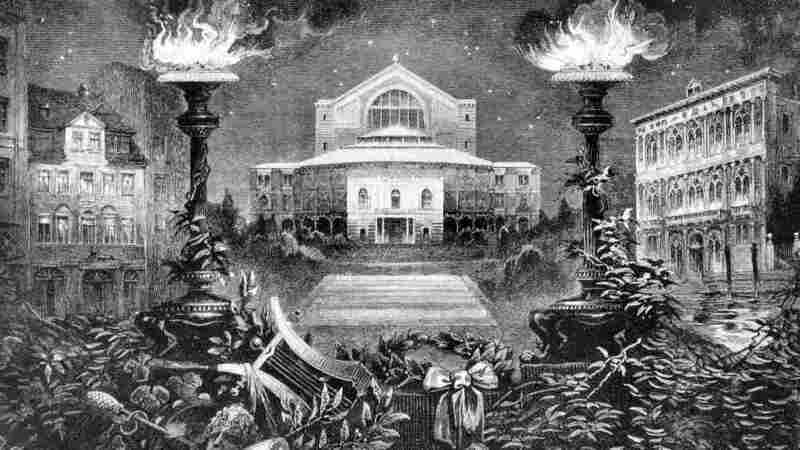 For Wagner, music is drama — a drama of extremes. He created a new, multidimensional form of expression through a mix of music, drama and poetry that changed forever how the world thought about and experienced opera. When I conduct Wagner's music, I'm drawn to the excess and to the extreme commitment in his music. There is a luxuriance of melody and an opulent use of leitmotifs — the musical themes Wagner assigned to characters and situations. There's even the instrument he invented himself, the Wagner tuba: a cross between a horn and tuba, the instrument possesses the bestial and primitive qualities evoked in the strange realms and characters of his operas. To mark the Wagner bicentennial in concert, I'm pairing an orchestral suite extracted from the Ring cycle with a Wagner-centric percussion concerto by American composer Christopher Rouse. Der Gerettete Alberich (Alberich Rescued) imagines life after Wagner's Ring cycle ends. It stars one of the Ring's principal characters, the evil dwarf Alberich, who set the entire tale of greed and betrayal in motion. Rouse begins with the same music that closes the Ring. Then, Alberich appears in the form of a raspy guiro (the Latin American percussion instrument). The concerto takes us through many twists and turns — including a stint for Alberich as a 1970s rock 'n' roll drummer. It's all musically motivated and derived from Wagner's own music, brilliantly contorted and disguised by Rouse, and designed to showcase the virtuosity of the percussion soloist. This piece creates over-the-top excess for our own time. We cannot speak of Wagner without acknowledging his virulent antisemitism, captured in his prolific writings. Our view of him today is further affected by the fact that the Nazi Party, long after Wagner's death in 1883, adopted him as its mascot, distorting, magnifying and hijacking his music, along with his antisemitic and nationalistic writings, as propaganda tools. For me, it's essential to raise the question of whether it's possible to separate the creator from his creations — which, in Wagner's case, include some truly astounding music. We will also explore the dark side of Wagner in A Composer Fit for a King: Wagner & Ludwig II, a new work by playwright and stage director Didi Balle. This through-composed play captures the real-life backstage drama behind the making of the Ring cycle, which spans 12 years in the tumultuous relationship between Wagner and his cunning young patron, King Ludwig II of Bavaria. In the process of achieving his goals, Wagner willingly compromised the lives and reputations of those he'd claimed as friends — not only the king, but also his first wife, Minna, conductor Hans von Bulow and a long list of friends and associates he'd fleeced, cheated, defamed and/or cuckolded. The symphonic play brings together the very same triumvirate of music, drama and poetry that consumed Wagner's vision and defined his life's work. Written with contributions from Didi Balle.